Miss Enid lives only a very short distance from St. Hilary's. She arrived in Daffodil Green all on her own because she has no close family any more. 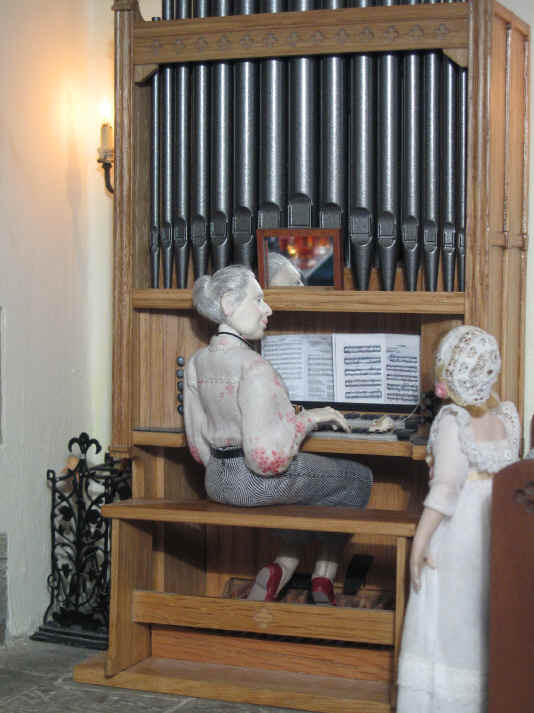 However her one great love is music and when she was very small she so loved listening to the organ in church she vowed SHE would be an organist one day..........and so she had lessons and practised REALLY hard and eventually became a really good one! Priscilla Jane is the first girl to notice that a new lady is sitting on the organ stool! The new lady is Miss Enid, who has just arrived in the village of Daffodil Green. 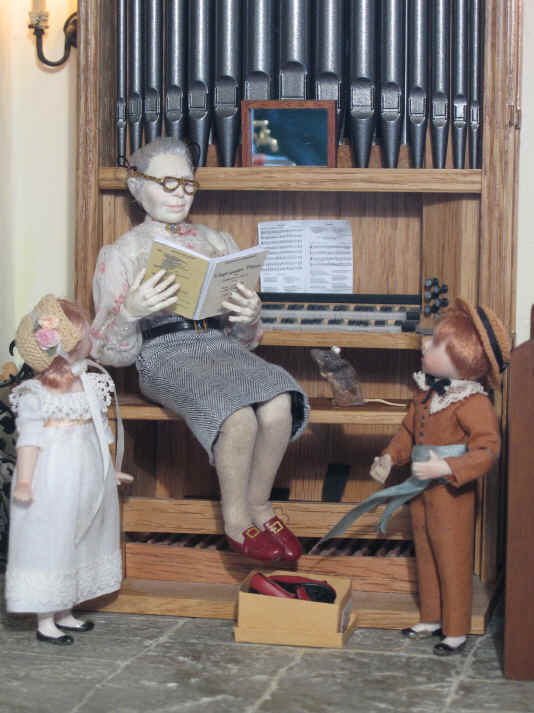 She loves playing the organ and can't resist hearing what this lovely two manual pipe organ sounds like! Isn't it good that she remembers to keep her special organ shoes with her all the time? Many organists like to have a special pair of shoes to play the pedals on the organ. Priscilla Jane helps Miss Enid change her shoes whilst Georgie, Robert Alexander's pet dog, looks on. Poor Miss Enid's eye sight is not as good as it was when she was younger. She therefore ALWAYS has her special pair of specs with her too...................and to make sure she never loses them she keeps them around her neck on a chain! Megan and Ben are fascinated to meet a new visitor to St. Hilary's whilst Miss Enid is busy making sure she reads ALL the music notes correctly BEFORE playing this piece of music to them. Oh dear though........look who ELSE has also come to see Miss Enid........it is Snowy the friend to the church mouse, Nunc Dimittis! NAUGHTY Snowy wanting to frighten poor Miss Enid........AND on her very first visit to St. Hilary's too! The vicar hears Miss Enid playing too and also comes to see her! He is SO impressed with her playing (he even secretly thinks she looks lovely too but is too shy to admit that to her......yet!) 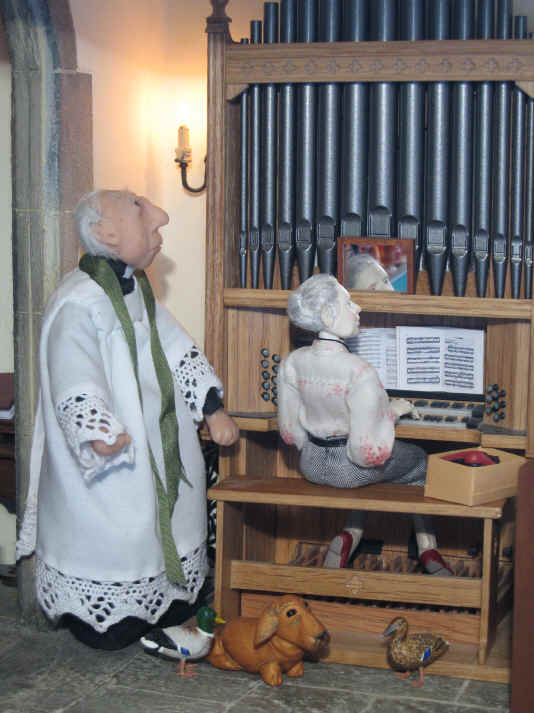 he takes his courage in both hands and asks her if she would like to be St. Hilary's new church organist? He is so delighted because, when she finishes playing.........she says......YES! Bardsley the bishop's dog and the ducks, Esme and Ernest, are very happy to hear that Miss Enid has joined their church! 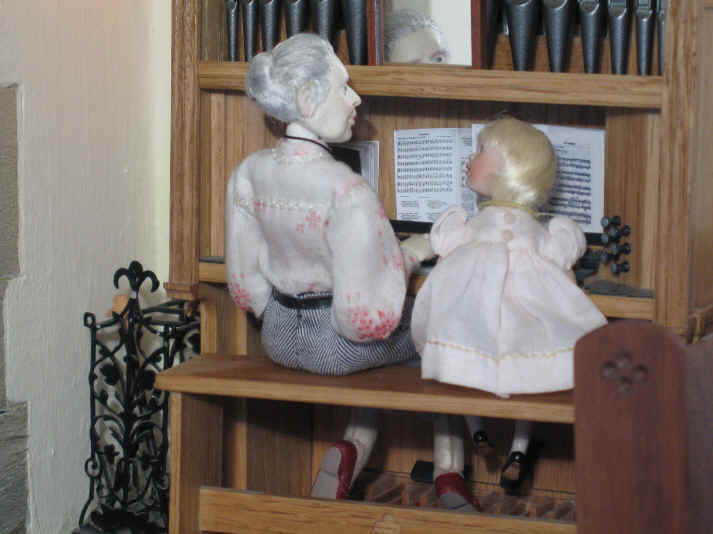 Pheobe comes over and immediately asks Miss Enid if she can sit next to her on the organ stool as Miss Enid plays..............Miss Enid is delighted and after she has finished playing to her they have a long chat about music. Pheobe is very musical and the vicar has often let her play for the hymns in church. 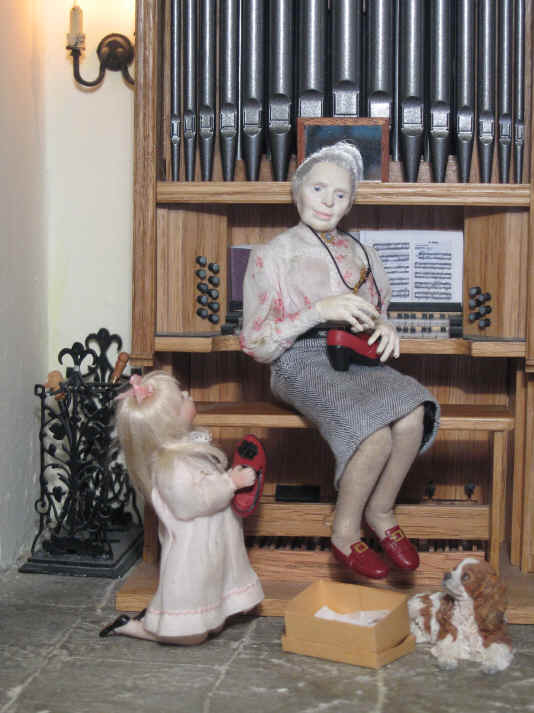 However she is thrilled to have a REAL organist again who can teach her how to play the organ even better! AND, of course, Miss Enid can play the pedals but she is too small to reach them..........yet! Miss Enid feels that everyone in St. Hilary's are so friendly she is looking forward to her new life in Daffodil Green.